Whilst these pistachio biscuits make an excellent Christmas gift, they’d be just as good for any celebration throughout the year. Made slightly smaller and a little neater, they’d also make excellent wedding flavour favours. They keep remarkably well and although they might soften over time, they are just as delicious and have a nice slightly chewy texture. 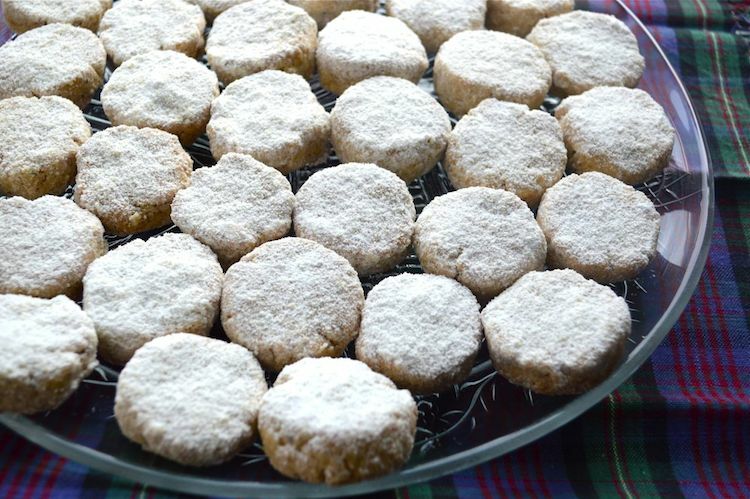 I adapted a recipe in Bake it Better Biscuits by Annie Rigg that I borrowed from the library. I used our local wholemeal flour, of course and made a few other tweaks to the ingredients and method. Crisp and crumbly nutty shortbread type biscuits flavoured with a little cardamom, cinnamon and rose. Ideal as a Christmas gift. Toast the almonds in a hot oven for 4-6 minutes until lightly golden. Do take care not to burn them. Leave to cool. Cream the butter and sugar until light and creamy. Add the salt and spices and cream some more. Blitz the almonds and pistachios in a coffee grinder or food processor until roughly ground. It's good to have some powdered and some bits for a bit of extra texture and crunch. Sieve in the flours and baking powder and mix until incorporated. Stir in the water and then gather together with your hands to form into a ball of dough. Take off walnut sized lumps and roll them into balls. Place onto lined baking sheets, slightly apart. Bake at 180℃ for about 15 minutes or until lightly golden. Sieve the icing sugar into a bowl, then roll the biscuits to cover, one by one. Place on a wire rack to cool completely, then dust lightly with any remaining icing sugar. As I used our local wholemeal flour from Cotehele Mill, I’m sending these pistachio biscuits off to Tea Time Treats hosted by Lavender and Lovage and The Hedge Combers. The theme this month is Local Ingredients and Recipes. Hahaha, not everyone has to like everything Sammie. I’m sure these would work fine without cardamom. You might want to up the cinnamon slightly or maybe add a little lemon zest instead. I’d love to try these. The combination of flavours is very appealing. Last week I happened to have bought a new little bottle of rose water …. Excellent timing Henk, these were meant to be. These sound so gorgeous, love all the flavours. But Pete’s our resident baker and he has taken against both cardamom and pistachios. Perhaps I’ll have to make them myself?! Oh no Kavey, that’s no good. Sounds like you need to make these biscuits and convince him just how good these flavours are. Middle Eastern flavours are wonderful indeed. They aren’t too in your face, but are beautifully aromatic and very tasty. Like someone else commented, I don’t like cardamom either but I can just leave that out, as these biscuits look lovely. Hmmm, seems cardamom is not doing to well at the moment – all very strange 😉 But yes, as you say, it can just be left out. Oh what fantastic flavours! Like some of the others, I’m not overly keen on cardamom on its own but find it works beautifully with other flavours and I imagine when it’s blended with the rosewater and cinnamon flavours these biscuits taste delicious. I’ve never heard of Holy Lama spice drops before, I just looked them up, I might treat myself to some. Thank you also for sharing my cookie recipe. Yes, it seems cardamom isn’t as popular with some as it is with me. I have a jar of sugar with a load of cardamoms in, which gives a subtle citrus flavour to bakes which might be better for those not too keen. The spice drops don’t lose their potency like ground spices, so they are great for spices yo don’t use very often. These look incredible, I love cardamom! YUM. I love cardamom! These cookies look wonderfully delicious. Yay, another cardamom fan Angie. It’s quite a subtle flavour combined with the others, but it works really well in a sweet biscuit. Thanks Camilla. Almonds are a wonderful nut and work so well in pretty much any form of baking. Choclette, this is just the sort of biscuit I love with a nice cuppa tea! Have all the ingredients on hand except the pistachios, will have to pick some up today and get baking! Oh do give them a go and let me know what you think Jean. I’m very tempted to whip up a batch soon too. love these… adore almonds in most things but in biscuits they are the best! These look really delicious and I love all the middle eastern flavours you have used in them. Finally made them ! I changed a few minor things in the ingredients: 100 g wholemeal spelt + 30 g corn flour + 50 g rice flour + 70 g white spelt. Also I changed the way the dough is made, to make it simpler. With these ingredients nothing could go wrong tastewise , I thought. And indeed, the cookies are very delicous and nice and brittle, mmmmmhhhhh. Nice flavour and good aftertaste, not too sweet and not too fat. What a pity pistachio’s are so very expensive. Last time I paid 3.50 €/100 g …. Glad they worked Henk. I’m feeling I have a biscuit deficiency in my life at the moment, so I might have to make some for myself. But yes, pistachios are very expensive, which is why I think of them as a Christmas treat.